In the resurgence of contemplative spirituality currently making its way through North American Christianity, the name of Ignatius of Loyola is a common one. Other than his ‘Spiritual Exercises' he is best known for founding the Society of Jesus, more commonly known as the Jesuits. But Ignatius did not found the Society on his own, he was one of a group of monks. I'd like to tell you about another of the co-founders of the Jesuits. Born in the Castle of Xavier near Sanguesa, Francis Xavier proved to be a man of great promise. He went to Paris, where he entered the collège de Sainte-Barbe. Here he met Savoyard, Pierre Favre, Ignatius Loyola, and four others, Lainez, Salmerón, Rodríguez, and Bobadilla; together the seven made the famous vow of Montmartre, Aug. 15, 1534 which led to the founding of the Jesuits. The original intention of the seven was to carry the gospel to Islam. It didn't happen. However, the Pope did employ the Jesuits throughout Europe in a variety of positions. Whatever their mission, they labored in prisons, among the needy, and with the sick. It was at this time that King John III of Portugal asked the Pope for missionaries to evangelize his Far Eastern possessions. Xavier was chosen. Immediately he departed for Portugal. There he met the king, who begged Francis to visit all his territories, report on the state of Christianity in them, and to do all he could to bring Christianity to the lost. For three weeks, opposing winds kept Xavier from sailing. When the wind finally turned, the monks set up a pulpit and Francis preached to the people gathered at the docks to say farewell to loved ones. As he finished his sermon, he was told about a young man who had been mortally wounded in a duel. Francis went immediately to the young man's side and pleaded with him to forgive the man who had wounded him, but to no avail - he refused. "Would you pardon him if God granted you life?" Francis is reported to have asked him. "Yes," was the reply. "Then you will recover," said Xavier. The young man did, and Xavier sailed for India. He landed at Goa, May 6, 1542 and spent five months preaching and ministering to the sick in the hospitals. About October, 1542, he started for the pearl fisheries of the extreme southern coast of the peninsula, where he hoped to restore Christianity which, although introduced years before, had almost disappeared on account of the lack of priests. He devoted almost three years to the work of preaching to the people of Western India, converting many, and reaching in his journeys even the Island of Ceylon. In the spring of 1545 Xavier started for Malacca. He laboured there for the last months of that year reaping a great spiritual harvest. About January, 1546, Xavier left Malacca and went to Molucca Islands, where the Portuguese had some settlements, and for a year and a half he preached the Gospel to the inhabitants of Amboyna, Ternate, Baranura, and other lesser islands which it has been difficult to identify. 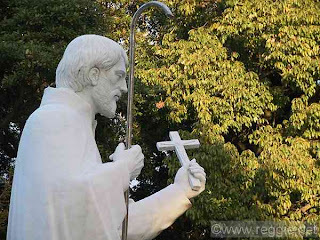 It is claimed by some that during this expedition he landed on the island of Mindanao, and for this reason Francis Xavier has been called the first Apostle of the Philippines. But so far it has not been proven absolutely that Xavier ever landed in the Philippines. By July, 1547, he was again in Malacca. Here he met a Japanese called Anger (Han-Sir), from whom he obtained much information about Japan. His zeal was at once aroused by the idea of introducing Christianity into Japan, but for the time being the affairs of the Society demanded his presence at Goa. He finally left for Japan towards the end of June, 1549. Anger, who had been baptized at Goa and given the name of Pablo de Santa Fe, accompanied Him. They landed at the city of Kagoshima in Japan, Aug. 15, 1549. The entire first year was devoted to learning the Japanese language and translating into Japanese, with the help of Pablo de Santa Fe, the principal articles of faith and short treatises which were to be employed in preaching and catechizing. Leaving Kagoshima about August, 1550, he continued his mission eventually traveling all over Japan preaching the Gospel and establishing missions. After working about two and a half years in Japan he left this mission in charge of Father Cosme de Torres and Brother Juan Fernández, and returned to Goa, arriving there at the beginning of 1552. Next he turned his thoughts to China, and in April, 1552, he left Goa and in the autumn he arrived at the small island of Sancian near the coast of China. While planning the best means for reaching the mainland, he was taken ill, and as the movement of the vessel seemed to aggravate his condition, he was removed to the land, where a crude hut had been built to shelter him. In these wretched surroundings he breathed his last. A statue, remembering Xavier , stands in Kameyama Park, Yamaguchi, Japan (photo). In the short space of ten years (May, 1542 - December, 1552), he traveled 9,000 miles, an incredible feat the transportation in those days. He brought the gospel to more than 50 nations, and baptized over one million converts. In the history of missions work his accomplishments have no equal. To many, Francis Xavier is considered the greatest missionary since the time of the Apostles. He was canonized with St. Ignatius in 1622, although due to the death of Gregory XV, the Bull of canonization was not published until the following year. St. Francis Xavier, the Apostle to the Indies, set sail from Goa for India on his 35th birthday, April 7, 1541 — 466 years ago this week. April 1, 1548 - British Parliament orders the publication of the Book of Common Prayer (BCP) designed to ensure that any Christian in Britain could walk into any church in the land and be familiar with the order of worship. The final form of the BCP was established by Thomas Cranmer and he is rightly credited with its creation, but it should be noted he worked with a committee of scholars to assemble the prayers and other components before editing the final liturgy. April 2, 1877 - Birth of Mordecai Ham in Allen County, Kentucky. A fundamentalist Baptist evangelist by the end of his ministry, he laid claim to over one million converts—including Billy Graham, who responded to the call at a 1934 Ham meeting in Charlotte, North Carolina. April 3, 1528 - Adolf Clarenbach, German teacher and principle, is arrested, for promoting the teachings of the Reformation. After being imprisoned and tortured for over a year, on September 28, 1529, Clarenbach and another reformation preacher, Peter Fliesteden, would become the first martyrs of the Reformation when they are burned at the stake in Cologne. April 4, 397 - Ambrose of Milan, the most universally loved and respected bishop of the early church, dies. Biblical scholar, political theorist, musician, and teacher, Ambrose was, to use a modern expression, a force to be reckoned with during the fourth century. He once brought Roman Emperor Theodosius I to his knees in repentance after the emperor had ordered a massacare of his citizens. He is most often mentioned in history books as the teacher of his most famous pupil, Augustine of Hippo. April 5, 1811 - Robert Raikes, founder of English Sunday schools in 1780, dies. Raikes built his Sunday schools not for respectable and well-mannered children of believers, but for (according to one woman's description) "multitudes of wretches who, released on that day from employment, spend their day in noise and riot." In 4 years, 250,000 students were attending the schools; by Raikes's death, 500,000; and by 1831, 1.25 million. April 6, 1528 - Albrecht Durer, German painter, engraver, and designer of woodcuts, dies. Famous for his religious scenes, he may have been so influenced by Luther (whom he called "the great Christian man who has helped me out of great anxieties") that he converted to Protestantism. His most popular work is "Praying Hands ".